Peter Collins' initial racing experience came in the post-war 500cc competitions in a Cooper, bought for him by his parents. 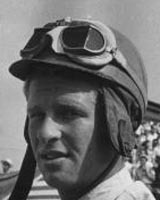 His break in Formula One came in 1952 (the year he won a nine-hour endurance race at Goodwood in an Aston Martin) when he replaced Stirling Moss in the HWM team, but after two disappointing seasons he moved on, taking drives with Vanwall, Maserati and BRM (his one outing for the last of these ended in a crash during qualifying). Away from F1, he continued to thrive driving for Aston Martin. In 1956 he was signed by Ferrari on the strength of a superb drive with Moss to win the Targa Florio in Sicily - the move proved inspired - he won back-to-back races in Belgium and France. He was poised to secure the drivers' title when he handed over his car to Juan Manuel Fangio during the Italian GP and the car then suffered mechanical failure. Collins finished the season in third. While disappointed, the gesture in handing the vehicle to Fangio won him tremendous praise in Italy. Enzo Ferrari was so grateful that his relationship with Collins thereafter was described as being akin to that of a father and son. In 1957, Mike Hawthorn joined him at Ferrari and the pair bonded immediately both on and off the track. But the car was not as competitive as it had been and two third-place finishes were the highlight of a disappointing season. All that was put right in 1958 when Ferrari introduced the Dino 246, allowing Collins to take his third and final win at the British GP. That success left him lying third in the drivers' championship, but two weeks later at the German GP Collins was killed when, chasing race leader Tony Brooks, he lost control and his car careered over a bank. He was thrown clear but crashed into a tree and sustained fatal injuries to his head.